US transportation secretary Elaine Chao. 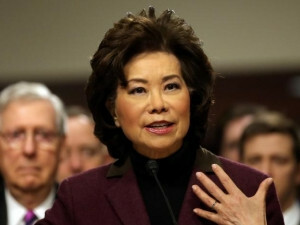 US transportation secretary Elaine Chao said on Sunday she was reviewing self-driving vehicle guidance issued by the Obama administration and urged companies to explain the benefits of automated vehicles to a sceptical public. The guidelines, which were issued in September, call on automakers to voluntarily submit details of self-driving vehicle systems to regulators in a 15-point "safety assessment" and urge states to defer to the federal government on most vehicle regulations. In November, major automakers urged the then-incoming Trump administration to re-evaluate the guidelines and some have called for significant changes. Automakers called on Congress earlier this month to make legislative changes to speed self-driving cars to US roads. Chao, in her first major public remarks since taking office last month, told the National Governors Association: "This administration is evaluating this guidance and will consult with you and other stakeholders as we update it and amend it, to ensure that it strikes the right balance." She said self-driving cars could dramatically improve safety. In 2015, 35 092 people died in US traffic crashes, up 7% and the highest full-year increase since 1966. In the first nine months of 2016, fatalities were up 8%. Chao, noting research that 94% of traffic crashes were due to human error, said: "There's a lot at stake in getting this technology right." She said the Trump administration wanted to ensure it "is a catalyst for safe, efficient technologies, not an impediment. In particular, I want to challenge Silicon Valley, Detroit, and all other auto industry hubs to step up and help educate a sceptical public about the benefits of automated technology." Companies including Alphabet's self-driving car Waymo unit, General Motors, Ford Motor, Uber Technologies, Tesla and others are aggressively pursuing automated vehicle technologies. Chao said she was "very concerned" about the potential impact of automated vehicles on employment. There are 3.5 million US truck drivers alone and millions of others employed in driving-related occupations. She also said she would seek input from states as regulators develop rules on drones. "We will ask for your input as the [Federal Aviation Administration] develops standards and regulations to ensure that drones can be safely integrated into our country's airspace," she said.